Under license of Universal Monsters comes the Funko Hikari Sofubi Japanese Vinyl hand-made and crafted Platinum Frankenstein's Monster figure. Limited Edition of 750. Funko's popular Hikari line expands with the Frankenstein Platinum Hikari Sofubi Vinyl Figure! With silver skin and suit, black-as-night eyes, silver boots, and silver hair, all with black highlights, this Frankenstein Hikari is a creepy guy! Dr. Frankenstein's Monster stands 7 1/2 inches tall and is limited to only 750 pieces worldwide! Ages 14 and up. Figure stands about 7 1/2" tall. Collectors Note: Factory sealed and picked directly from the manufacturer's cartons, he comes in special Funko Hikari Sofubi display box. 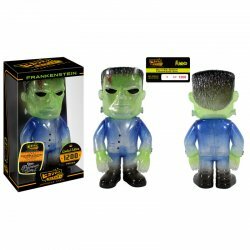 We also offer other Universal Monsters Hikari Japanese Vinyl figures while supplies last!